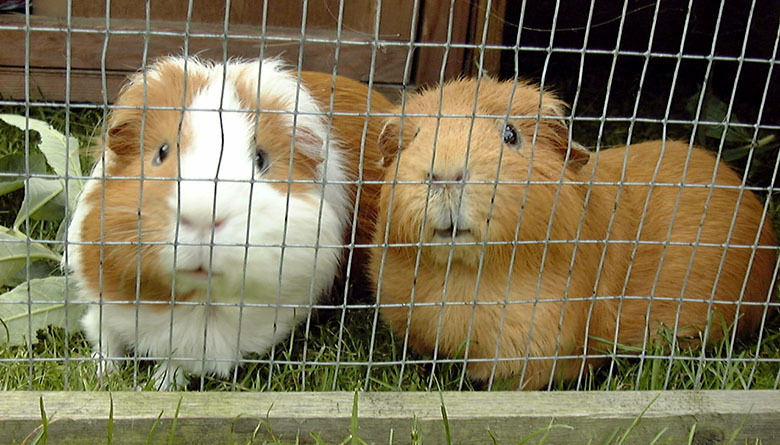 Coco and Clipper came to live with us in 1996. 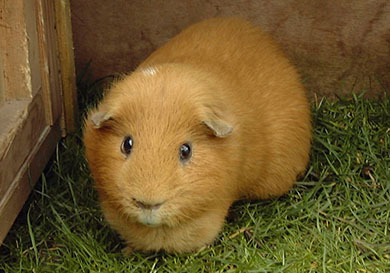 I had always been fascinated by the little squeaky things she had seen shuffling around in the hay at pet shops. 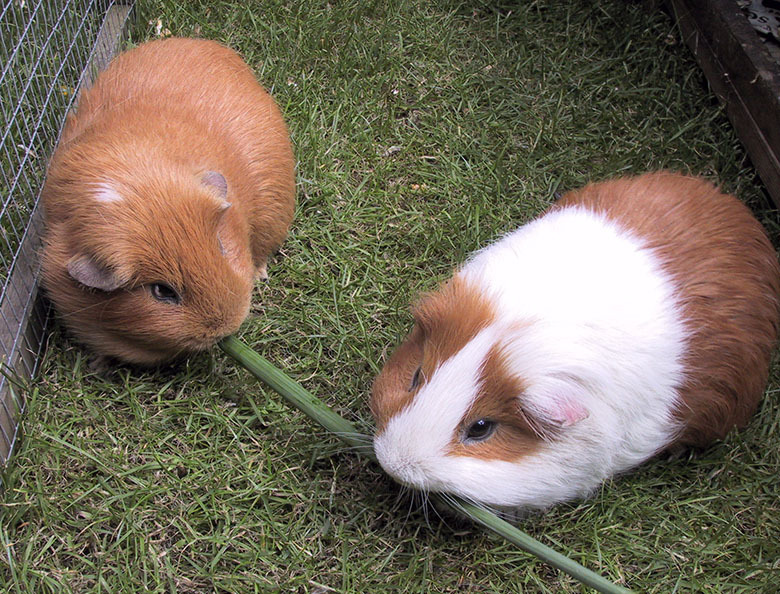 Coco and Clipper spent their days out in the garden munching on grass and anything else we could find to give them. They’d shuffle around their run muttering to themselves occasionally giving an ear piercing squeak, goodness knows what the neighbours thought! 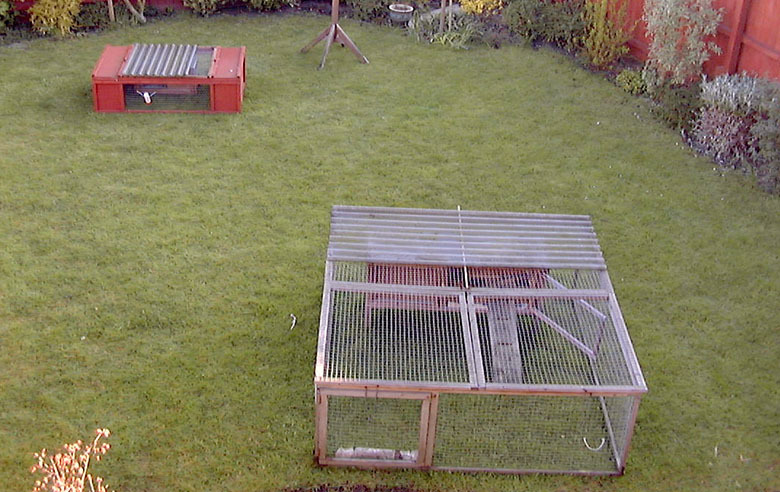 As with our bunnies, Coco & Clipper came in at night to keep them warm and safe. At night the bossy little chaps liked to whistle and squeak when they thought it was time to be fed, we had to oblige if we wanted any peace. 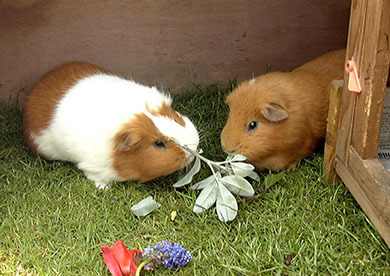 Their favourite bed time treat was Curly Kale, the smell of it sent them into a squeaking frenzy. 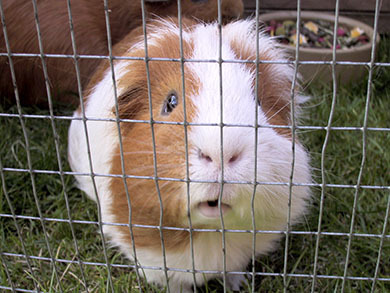 Sadly Coco died and we miss the grumpy little chap terribly. He was having problems with bladder stones and it all got a bit to much for him. He had been to see the vet and was receiving treatment, but he took a sudden turn for the worse. I rushed him to the vet, but there was nothing to be done and he passed away in my hands before the vet even saw him. It was a terrible shock. We kind of took Coco and Clipper for granted, they seemed such robust little chaps, spending their day chomping at the grass. We love them dearly, but they were happy with each other and were only interested in us when we had weeds or flowers to feed them. Even so we are going to miss Coco and the funny noises he and Clipper would make chattering to each other. Clipper's home has fallen apart! Clipper is still happily munching his way through the garden. Unfortunately his run fell to pieces the other day, it had been getting a bit shabby (not helped by the cats sitting on it and using it as a scratching post). We had been thinking of ways to repair it, then when Derek picked it up to move it, the whole thing came apart! It was an emergency trip down the pet shop and now Clipper has a new one, this time I have treated it with wood preserver. Not that we mind if the little chap out lives this run ;-). He had been a bit under the weather for the last week or so. Nothing you could put your finger on, he just wasn’t his usual chattering, greedy self. We had been keeping him in the house anyway, because of the cold weather. He didn’t seem to mind being inside, except when he found he couldn’t eat the carpet, and it did make it easier for us to keep a close eye on him. After saying “Goodnight” to him, like we always did before going to bed we had no real warning anything was wrong. The next morning I found him snuggled in his hay, like he’d passed away quietly in his sleep. It was a fitting end for our gorgeous chirpy and rather greedy squeaky guy. We are really going to miss him and his noisy ways, he did get so excited at feeding time. After six wonderful years of his squeaking and warbling the house will seem very quiet.